When celebrating Father’s Day (or any day) with your husband, what’s the #1 thing he’s always most excited for? You won’t even need 3 guesses to find the obvious answer: food! Meals are super important while on vacation, especially on this special occasion for dads. One of our highest recommendations is the Alamo Steakhouse, swiftly followed by the Timberwood Grill. And don’t forget to leave room for a little Ole Smoky Moonshine! Claimed as “the most awesome food from here to Texas,” the Alamo Steakhouse is a staple in Gatlinburg that boasts succulent starters, scrumptious soups and salads, tasty sides, mouthwatering entrees, and divine desserts. Begin with fried calamari and flame-grilled oysters, then move to the French onion soup with black-n-bleu filet salad. Next, cut into your filet mignon or oak-grilled salmon with a rice pilaf side and end the meal with blackberry cobbler or sea salt caramel cheesecake…or both! Taste the mountains at Timberwood Grill on The Island in Pigeon Forge, featuring finger-licking menu items from appetizers to main courses to cocktails — even their names are appealing! Top off his meals with a sampling of moonshine at the Ole Smoky Moonshine Holler (aka The Holler) in Gatlinburg. Better yet, take a few jars back to the cabin! As the most visited distillery in these United States, The Holler has a proud reputation to protect, so you can expect the best of the best moonshine here. Possible brews include butterscotch, peppermint, mountain java cream, apple pie, and blue flame. Plus, you’ll get to check out the entire distilling process and chat with the distillers about the traditions of TN moonshining. Take this Father’s Day up a notch with Dubby’s Xtreme Racing, starring European karts — the fastest in Pigeon Forge! Choose from 3 courses (one is elevated) ranging from 1,500 – 3,500 linear feet, then zip around the track together (or cheer him on from the sidelines). Whether he’s a kiddo at heart…or a proper big kid, he’ll be grinning from ear to ear as he zooms past contenders and across the finish line as grand champion! Watch out! The Island may be more fun than you can handle…nah, just kidding. This entertainment and shopping complex in Pigeon Forge boasts more than just delicious dishes. In addition to hearty restaurants (ahem, Timberwood Grill) and quaint boutiques with candies, trinkets, and toys, The Island boasts games and activities galore! Treat your husband to a full day of fun, from escaping prison and beating all the highest arcade scores to defeating the Sky Trail Explorer ropes course and winning top prize at the shooting gallery. Maybe your man’s more of an outdoorsman. Well, you’ve certainly come to the right place as the Great Smoky Mountains National Park is not only gorgeous and filled to the brim with outdoor adventure but also the most visited national park in the country! There’s everything from birdwatching to ziplining, and we bet your hubby will love a nice hike or bike through the wilderness along natural and manmade trails. Visit the 80-foot high Laurel Falls at the end of its moderate-level trail, which is 2.6 miles (about 2 hours) roundtrip with beautiful dropoffs. Dip your warm toes into the cool waters below the 20-foot high Abrams Falls after traversing its moderate trail, which is 5 miles (3-4 hours) roundtrip. Cycle around Cades Cove — a famed valley area with incredible views, woodland wildlife, fascinating flora, and multiple hiking trails (including Abrams Falls). Bike like never before around a natural and wooden 1-way course through the forest with ClimbWorks Smoky Mountains, an experience you won’t soon forget. 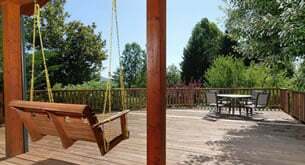 Whether you play in town or relax at the cabin all day, Cabins for YOU has the perfect pick for your Father’s Day getaway in Pigeon Forge and Gatlinburg, TN. Opt for a romantic weekend away at a 1-bedroom retreat, choose a 2-3 bedroom cabin for the whole family, or send him away on a trip with the boys at a large-group cabin. Barbecue steaks on the grill for a Father’s Day feast. Let the kids craft something for him at the dining table. Slip into the steamy hot tub for a rejuvenating soak. Watch action flicks and feel them boom in the home theater. Serve your sweetheart a hearty breakfast in bed. Pre-order a couple’s massage given at the cabin. Enjoy a midnight splash in the private indoor pool. Shoot pool, play foosball, and beat the highest arcade scores. Snooze in the master suite’s plush king-size bed. Treat your hubby to a Father’s Day he’ll always remember fondly with delectable dishes, mountain shine, thrilling races, Island games, outdoor adventures, and a relaxing cabin stay in the Great Smoky Mountains!